Judaism arose out of the religion of Israel. It came through lawgivers, priests, and prophets and was the outgrowth of centuries of development. For many generations, as we have suggested, the faith of which it was the fruitage obtained the undivided allegiance of only a minority of the folk who bore the name of Israel, but eventually it was held tenaciously by the majority of those who were called Jews. The disasters of the eighth and sixth centuries B.C. which erased the two small states that had been the political centres of the people led to a purification of the faith of the community which survived the debacle. The downfall of the Northern and Southern Kingdoms was the work of conquerors from the Tigris-Euphrates Valley and was accompanied and followed by the deportation of the leading elements and some of the masses. Others fled to Egypt. Only small and politically unimportant groups remained. Then, under the friendly tolerance of the Persian monarchs who brought Palestine within their boundaries, a new temple was built at Jerusalem which became the centre not only for the Jewish population of that region but also for the thousands of Jews who were scattered in other parts of Western Asia and of the Mediterranean Basin. The tie which held the Jews together was religious and the religion was Judaism. The loyalty of the Jews to their religion was heightened by persecution. Antiochus Epiphanes, one of the Seleucids who in succession to Alexander the Great built a realm in Syria and adjacent lands, sought to force Greek culture and manners on the Jews. This was met by a revolt led by the Maccabees and was followed by the setting up of a small state in which the high priest was the central figure. It also intensified among many the zeal for their faith. Later, in the first century before Christ, the Jewish state was brought within the growing power of Rome. 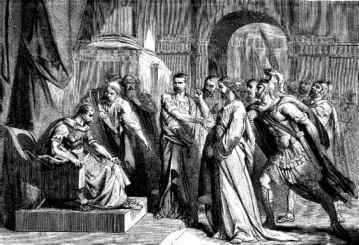 Herod, of non-Jewish stock but married into the Maccabeean family, with the consent of Rome established himself over the little state and rebuilt the temple in Jerusalem. Here was a sad ending of the Maccabeean dream. That dream had envisioned a community in which God's will as expressed in the Jewish law and prophets was to be perfectly observed. The outcome was a state governed by an alien ruler whose chief ambition was his own power and the establishment of a dynasty. Yet it was during the reign of Herod that Jesus was born and under Herod's descendants that Christianity had its inception.